Notice that we unintentionally skipped Halloween. Rather than making Halloween and Thanksgiving a month apart, let’s just mesh them together in a series of posts. My brother and his fiancé are in town for Thanksgiving week. Between their wedding planning activities (wedding is in May), I have a bit of extra time to blog. There’s this cute uncarved pumpkin left over from Halloween and a house full of people to feed. We have shrimp in the freezer and the other ingredients are around, too. Enough to make it happen. 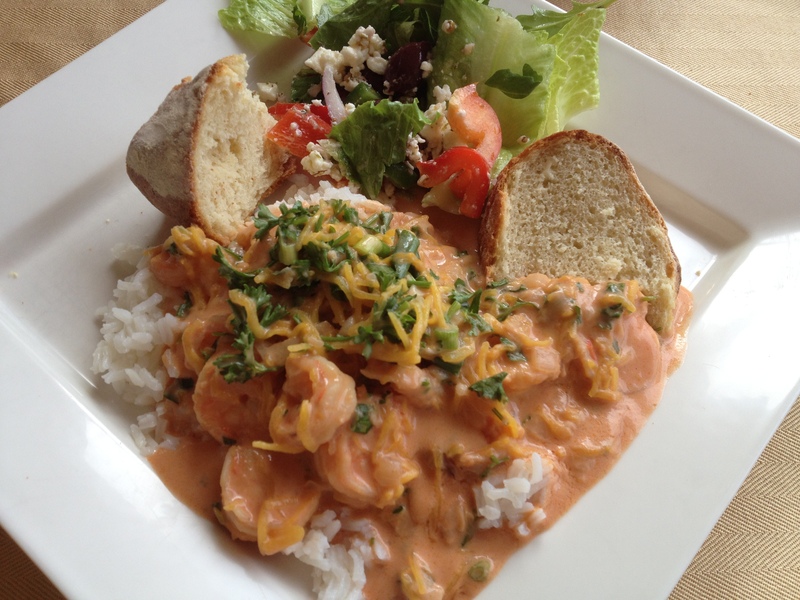 Shrimp in a pumpkin is a very Brazilian dish. We call it Camarão na Moranga. If you type the name in the blog’s search bar, you will find a different recipe for the same dish many posts back. I think this one tastes better and it is easier to prepare. You can always tell when something you cook tastes good, because people who usually don’t complement your food, or anything for that matter, make a complement. Cut the top off the pumpkin. (Make the cut large enough that you can easily serve from the top by inserting a soup ladle inside the pumpkin) Scrape the inside to remove all the seeds and fibers. I deviated from the recipe her and sprinkled seasoned salt on the inside of the pumpkin, just for a little added seasoning. Place the pumpkin, opened side down, on a baking sheet. Cover with aluminum foil and bake in the oven on 350 for 30 minutes. The cooking time will actually depend on your oven, the size of the pumpkin and the thickness of it’s interior. I had to cook mine for longer, maybe 45-50 min. When the pumpkin is almost cooked (tender yet firm—does that make sense? ), begin to prepare the shrimp. Heat the olive oil in a large sauté pan and add the onions and garlic. 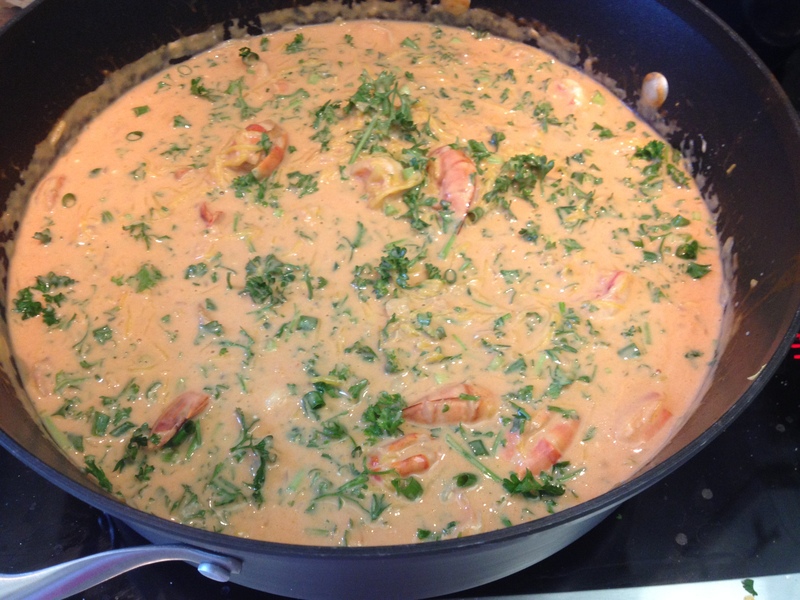 After a few minutes, add the shrimp (previously seasoned with the sea salt), tomatoes, and tomato sauce, and the flour dissolved in the milk. Let this cook/boil for about 5 minutes. Remove from heat and add the requeijão and table cream that were previously mixed together. Check the taste and add salt, if necessary. Use a ladle to add the shrimp mixture to the inside of the still-hot pumpkin. Return to the oven and bake for another 30 minutes. 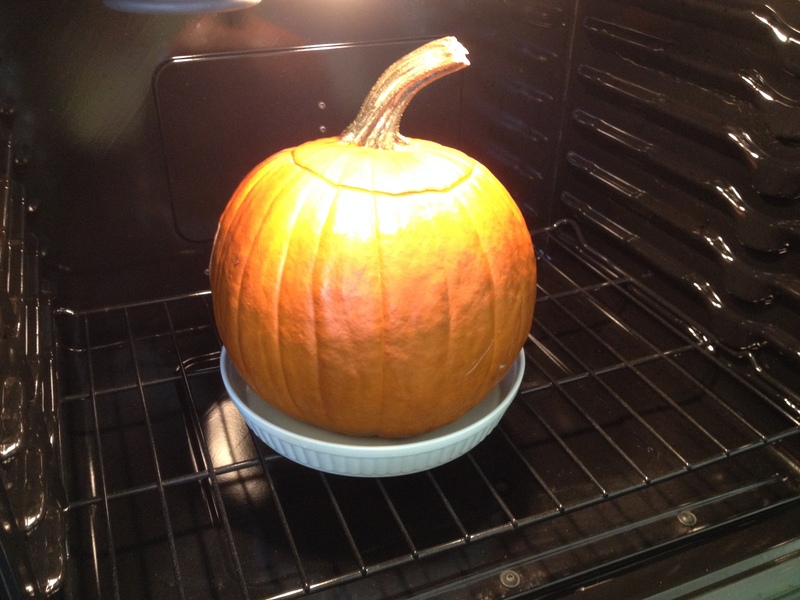 Note-if you fill the pumpkin to the top with the shrimp, the pumpkin may expand and overflow during baking. The pumpkin is ready when soft to the touch and the shrimp mixture bubbles. You have to eyeball the “done-ness” of the pumpkin. In this case, I turned up the heat to 375F for about 12 minutes. If you overbake the filled pumpkin, it could collapse into a blob. It hasn’t happened to me…but it can happen. Also, when it’s time to remove the pumpkin from the baking sheet, use a large/wide spatula on either side. Carefully lift the pumpkin using the spatulas and transfer to the dish. Saltamos o Halloween, pulamos para a semana de Thanksgiving, voltamos para o Halloween. Pelo menos assim será na sequencia do blog. O meu irmão e a noiva dele estão aqui essa semana para planejar o casamento que será em maio. Tem muita gente em casa para alimentar e sobrou uma moranga do Halloween. Os outros ingredientes são fáceis de encontrar. Vamos lá! Corte uma tampa na superfície superior da moranga e reserve. Retire as sementes com o auxílio de uma colher. Cubra a moranga com papel-alumínio e coloque em uma assadeira com a cavidade voltada para baixo. Leve ao forno pré-aquecido a 180 graus até que a moranga esteja macia e reserve. Em uma panela aqueça o azeite e refogue a cebola picada e o alho picado. Acrescente o molho de tomate, os camarões temperados com sal e pimenta, a farinha de trigo dissolvida no leite, o sal e a pimenta. Tampe e deixe ferver por 5 minutos. Retire do fogo e misture o requeijão já misturado com o creme de leite sem soro. Faça a correção do sal e da pimenta, se necessário. Recheie a moranga com este creme e leve ao forno pré-aquecido a 180 graus por aproximadamente 25 minutos. Polvilhe com o cheiro verde e decore a superfície com camarões grandes cozidos em água e sal. Obs. No blog tem outra receita para camarão na moranga, mas esta é mais saborosa.